The weather in the early part of the summer was more conducive to book reading than it was to boating. Fortunately, Friends of the Rideau came to the rescue with a good new read; The Sweeney Diary: The 1839-1850 Journal of Rideau Lockmaster Peter Sweeney. On July 3 we took delivery of boxes filled with shiny new Sweeney Diary books. All our volunteer work this winter, particularly the efforts of Sue Warren, Ken Watson, Rowena Cooper and Ed Bebee, paid off with a beautiful 198 page book. The printing of the book was funded by the Rideau Legacy Fund, our first project using this new fund (created last year with donations and our profits from Rideau 175 sales). Special thanks are extended to Sue Warren who made an exceptional contribution to the book. Sue did the first transcription of the diary over 20 years ago, and for this project she wrote a fascinating piece titled “The Life and Times of Peter Sweeney” which sets the entire diary into period context. Sue also provided brief biographies of everyone mentioned in the diary – listed in the “Who’s Who in the Diary” section of the book. The diary is a real Rideau treasure – it’s the only first hand account of a lockmaster in the 19th century. It provides insight into the life of a lockmaster in the early period of the Rideau Canal. While many historical articles about the canal have been written, all those are filtered by the biases of the writer. Peter’s diary, although somewhat cryptic, is an unfiltered look (he never wrote the diary for public consumption) at daily life at a lockstation. We are also very pleased to report that Parks Canada has undertaken to distribute a copy of The Sweeney Diary to all Rideau Corridor libraries – municipal, high school and university. This will provide easy access to this book for many in the Rideau area, particularly youth who will find this glimpse into their past both interesting and educational. So kudos to the Rideau Canal Office of Parks Canada for agreeing to undertake this project. And, in addition, we thank Parks Canada for providing us with permission to print the diary. The diary is available for purchase through our website (www.rideaufriends.com) and also at several local outlets including Stillwater Books in Westport, Novel Idea in Kingston, Hotel Kenney at Jones Falls, Mainly Antiques and The Hub in Elgin and the Rideau Canal Museum in Smiths Falls. If you haven’t seen it yet – run out and buy a copy! Our 2008 AGM was held on May 10 at the Royal Canadian Legion hall in Merrickville. We were pleased to have two special guests; Gordon Giffin, Superintendent of the Rideau Canal, and Juan Sanchez, Heritage Presentation Specialist with the Rideau Canal Office of Parks Canada. To start the meeting, Juan showcased a new Parks Canada Rideau Canal DVD. Parks hoped to have these at many tourist outlets this summer. Chair, Ed Bebee, reviewed the year for Friends, noting that 2007 was one of the busiest years on record for Friends due to our involvement with the Rideau 175 celebrations. We had our booth set up at many of the Rideau 175 events, starting with the grand opening event in Smiths Falls on May 22 and culminating with the Tribute to Labour at Jones Falls on September 1. It was quite a volunteer effort to have a presence at many of the events taking place throughout the summer. Ed also mentioned that two directors, himself and Ken Watson, released new books in 2007. Both Ed’s Fish Tales and Ken’s The Rideau Route were very well received. Ed also announced that Friend’s latest book, The Sweeney Diary: The 1839-1850 Journal of Rideau Lockmaster Peter Sweeney was in the finishing stages and was expected to be available at the end of June. Ed said that, in addition to projects such as Sweeney, we participate in several Rideau initiatives including the Rideau Heritage Network. And while we are not a political group, we did help to lobby for the repair (rather than tear-down) of the Andrewsville Bridge near Nicholsons Lock. Ed also made special mention of the exceptional service provided to Friends by our Parks Canada liaison officer, Mary Ann Stienberg. Following the financial report and election of directors, Ed introduced our guest speaker, the new Superintendent of the Rideau Canal, Gordon Giffin. Gord gave a stirring talk about the Rideau. The waterway has been an inextricable part of his life since he was a child, his mother came from Merrickville and his father from Smiths Falls. He began his career on the Rideau, rising to become Lockmaster at the Ottawa Locks. He noted that the Rideau was an enormous asset, today’s replacement cost for the structures along the waterway is seven hundred and thirty million dollars. It is up to everyone, the government, residents and visitors to help protect this valuable Canadian heritage asset. Gord talked about a landscape study of the waterway that is just beginning and said that most residents along a test area for the study were in favour of it proceeding. He also expressed concern about erosion of the shoreline and speeders who cause dangerous wakes. The challenges for the future include managing the environment (including biodiversity and water supply and quality) and preserving and protecting the canal in the face of urban growth and more intense use. In dealing with heritage and economics it should be possible to find win-win outcomes. His overriding message was that the waterway system has to be preserved safely for future generations and that we all have a responsibility to ensure that this happens. After Gord’s talk the meeting moved outdoors, with a guided tour by Juan Sanchez featuring the locks, the old Merrickville Industrial complex and the Merrickville blockhouse. An appreciative audience enjoyed both the lovely spring day and Juan’s interesting observations about the history and use of these structures. Directors: David Brett, Jeanne Brett, Sheilagh Dubois, Mark King, Josephine MacFadden, Brian Osborne and Ken Watson. If you attended some of the Rideau events this summer, chances are you came across a Friends of the Rideau booth manned with smiling volunteers. We were out and about at a number of events this summer. 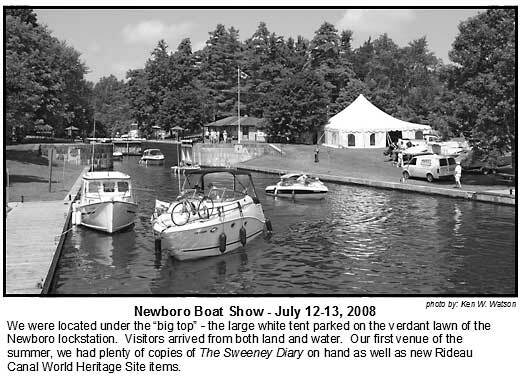 Our first events this year were the Newboro Boat Show and Merrickville’s Canalfest – both events held on the same weekend (July 14-15). Fortunately, since we have a presence in Merrickville (The Depot) we were able to cover both events. 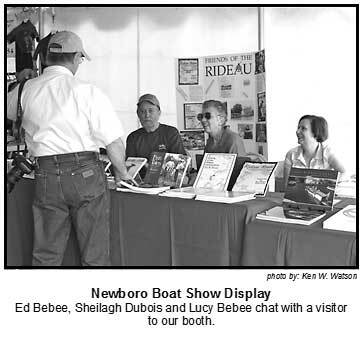 At the Newboro Show we had Ed Bebee, Lucy Bebee, Sheilagh Dubois and Ken Watson “working the booth.” We had dozens of brand new copies of The Sweeney Diary along with brand new Rideau World Heritage Site branded cups, caps and t-shirts (plus the usual assortment of Rideau books and clothing). At Canalfest, Dave Brett and Jeanne Brett held down the fort for Friends – that is when Dave wasn’t off playing pirate. Our next event was the Rideau Canal Festival held in Ottawa on the August long weekend (to coincide with Colonel By Day). A brand new event, we got parked in the environmental product displays and were a little hard to find. But we had a great group of volunteers, including members Russell Smith, George Neville, and Gillian Organ, with Rowena Cooper, Hunter McGill, and Ed Bebee bringing all the books, other merchandise and handling the sales. This worked great! We’re working with the organizers to get a more visible presence for next year’s festival. We attend the Antique and Classic Boat Show every year, and this year was no exception. Held at the Long Island Lockstation in mid-August, Rowena Cooper and Hunter McGill were our friendly volunteers. Our last event for the year was the World Canals Conference (WCC) held in Kingston in September. This was quite a special event since the WCC doesn’t often come to Canada. We had Dave Brett and Ken Watson manning the booth on day 1, Rowena Cooper and Jo MacFadden on day 2 and Rowena Cooper holding down the booth on her own on day 3. Many of the delegates were quite impressed by our display, particularly the range of books we have about the Rideau. But it was a Serbian delegate (the WCC is being held in Serbia next year) who was most impressed. “You do this for government?” he asked. “No, we’re volunteers, we do this on our own time because we love the Rideau.” “Volunteers?” he asked. “Yes, non-profit organization” we replied. “Very good” he replied “very, very good!” We guessed that they don’t have a lot of non-profit volunteer organizations supporting Serbian canals. Next year, we plan to make more use of our members and invite them to come and promote the Rideau with us at local events. Don’t say you weren’t warned! Our local variety of zebra, the small invasive mollusc known as the zebra mussel, appears to be somewhat in decline. This is not to say that they are disappearing, far from it, but their numbers have backed off from the initial invasion years (early 2000s). One theory is that they’ve gobbled up all the excess food supply and their numbers have now retreated to match the yearly renewable food supply (mostly single-celled algae). We’ve seen a number of changes due to the zebra mussels. Water clarity in some of the lakes has improved (upwards of 25%). However this has had the negative effect of allowing aquatic vegetation to take root in deeper water. In the pre-zebra mussel era, aquatic vegetation was rare in water over 3 metres in depth, now it can be found growing in water up to 4 metres deep (since light can penetrate deeper into the water due to improved clarity). We’ve seen the invasion of the green blobs, a side product of zebra mussels filtering out single-celled algae (which used to keep filamentous algae, which form the blobs, in check). The blobs have always been here, but they used to be a transient spring event, rather than lasting through most of the summer. Presumably if the zebras are really on the decline, we’ll be seeing further changes in the waters of Rideau’s lakes and rivers. The World Canals Conference was held in Kingston from September 14 to 17, 2008 with the theme Managing Canal Corridors in the 21st Century. Whether or not you attended the event, you might be interested in perusing some of the talks. We’ve partnered with Parks Canada to provide digital copies of some of the talks via our website. 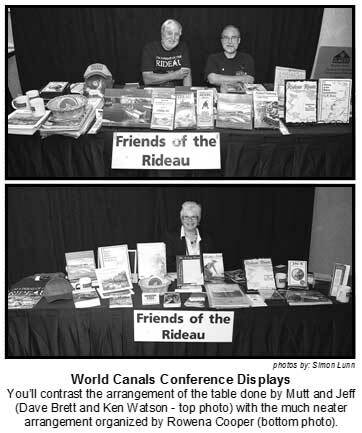 Head over to: www.rideaufriends.com and click on the link to the World Canals Conference Talks. On that page you’ll be able to view/download many of the talks in PDF format. There are also a couple of on-line photo galleries with images of the conference and the Rideau. Way back in 1998, Ken Watson hatched a project proposal for Friends of the Rideau and Parks Canada titled “Resources for the Rideau.” Although the project didn’t fly at that time, ten years later part of the proposal has taken flight with the publication of our first book on CD – Construction History of the Rideau Canal by Karen Price. This is the first of a series of Rideau research reports that we plan to re-publish. Price’s book is a Rideau Canal Manuscript Report. Produced in limited quantities in the 1970s and 1980s, these Parks Canada reports are a series of high quality research documents detailing various historical and heritage aspects of the Rideau Canal. They are an invaluable resource for anyone interested in learning details about the Rideau Canal; topics ranging from exactly how the locks were built to information about how the canal construction camps were supplied with food and materials. What gave life to this new project was Parks Canada’s participation in the Sweeney Diary book project. Mary Ann Stienberg, Friend’s liaison officer with Parks, in discussion with Ken Watson about the diary, offered to have some of their available Katimavik students scan (OCR) the transcription of the diary. Once the diary scan was completed, knowing there was now an OCR skill set and available help (Katimavik students) in the Rideau Canal Office, Ken suggested that a good continuation would be to scan some of the manuscript reports. Four reports were selected and over the next several months, students in the Rideau Canal Office, under the supervision of Cheryl Gulseth, scanned the reports. Parks Canada gave Friends of the Rideau permission to re-print these reports and make them available to the general public. To this end, the scanned reports are now being worked on by Ken, formatting them into digital book form. The digital book is simply a PDF file that duplicates the original report (page for page, so citations from the paper report will match the digital version). We released the first book, Price’s Construction History of the Rideau Canal at the World Canals Conference in Kingston. It sells for the modest price of $14.95 (see our website: www.rideaufriends.com for details). We choose to go the digital book route partly from a researcher-usefulness perspective and partly from the harsh economic realities of the unsubsidized book business. The digital book is fully searchable text (not page scans). This allows anyone with the PDF to do any type of text search they wish on the document and in seconds locate every reference to the item they are searching for. We know that these reports are going to serve a smaller market than our normal books. Providing them as a book on CD allows Friends to produce these on an “on demand” basis, so there is a very small up-front cost (since the book preparation is being done on a volunteer basis and we can simply print these “books on CD” as we need them). 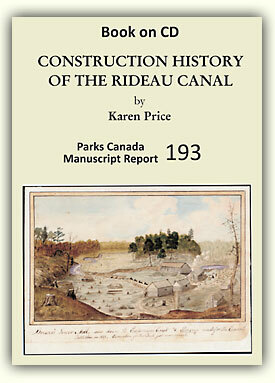 The four reports chosen to be done first, which will appear as books on CD over the next year are: “Construction History of the Rideau Canal” by Karen Price (now in print); “The Rideau Canal: 1832-1914” (a.k.a. The Rideau Canal: Defence, Transport and Recreation) by Judith Tulloch (currently being worked on); “Commercial Navigation on the Rideau Canal: 1832-1961” by Edward Bush and “Builders of the Rideau Canal” by Edward Bush. With the loss of Katimavik students help in the Rideau Canal Office we’re on our own to scan any future reports. A full listing of all the available Rideau manuscript reports as well as an outline of how you can volunteer to help out with this project can be found on our website at: www.rideaufriends.com/mrs/ See “You Can Help” below for more information. Do you know a little bit about scanning and word processing and have some time on your hands? If so, you might be interested in helping out with our Resources for the Rideau project – to re-publish several of Parks Canada's Rideau manuscript reports. The project involves taking a paper copy of the report, scanning the text (OCR) into a computer, and then proofing that text using a word processor (i.e. Word or WordPerfect). Friends will take that scanned/proofed document and turn it into a book on CD. A single volunteer doesn't have to do all the stages. This is a multi-year project and any help will be welcomed (OCRing, proofing, and/or formatting). It is completely a volunteer effort - no pay, only glory (you'll receive credit for your contribution in the digital book). Plus you'll know that your efforts will contribute to providing easier public access to the fascinating history and heritage of the Rideau Canal. In the midst of all its commercial bustle of the 1830s and 1840s, from every strategic military point of view, the Rideau route also steadfastly fulfilled the original purpose for its construction (in contrast to a June 30, 2007, article in the Kingston Whig, which claimed it never served its intended role!). It had been evident as early as 1815 that the American War Department had corrected its faulty wartime strategy and was set to focus on the vulnerable upper St. Lawrence in any future conflict. These lessons of the War of 1812 were as relevant in 1832 or 1846 as they had been in 1815. The most graphic reminder of this fact was the construction of the fortifications at Kingston; Fort Henry in the 1830s and the Martello Towers in the mid 1840s. In retrospect such paramount military considerations are easy to forget, simply because the expected next war with the United States never came. The Rideau continued to be the vital, secure supply line for Kingston, Lake Ontario and inland Canada for at least two generations after its construction. Could it have been that this grand military canal acted as a deterrent to American invasion? Did it play a role in helping to keep the peace during these decades of most vital Canadian social, economic and political development? It was, after all, these formative years that made Confederation possible. At any time it is difficult to calculate its effect as a deterrent. Given the magnitude of the expenditure on the Rideau, to say nothing of the imposing nature of the works themselves - and spread out as they were over 200 kilometers of eastern Ontario - no doubt should have remained in the American mind as to Great Britain’s firm resolve to defend the interior of British North America. The British Undersecretary of State for the Colonies in 1832 was unequivocal: the Rideau was “one of the greatest securities by which we hold the Canadas and the protection of every other great work which either has been, or may be, undertaken there”. On the other side of the Atlantic, the Canadian Commander of the forces urged preparation to “resist…the wonderfully increasing Power of our restless and ambitious neighours”. Any study of contemporary records in the period of the rebellions (1837-8) reflects the tensions of the day. There was a wave of concern for the need to defend each lock station, lest the pro-American sympathizers attempt to damage the works. Led by a warning from Newboro entrepreneur Benjamin Tett, enough loyal inhabitants on the Kingston side of the watershed were mustered by nightfall on July 4, 1838 to, as he wrote, “prevent the wicked and rebellious Designs of the marauders”. The Commander-in-Chief of the British forces, Lord Hill, noted that the Rideau was “the most useful and important work that had been undertaken for the prosperity and security of Canada”. His successor, none other than the venerable Duke of Wellington himself - that master architect and patron of Colonel By’s masterpiece - declared in 1841 that, despite its cost, none could doubt “the wisdom of the plan, its efficiency and above all its Economy”. Notwithstanding Wellington’s understandable bias, what a posthumous testimony to John By, who had been so unceremoniously recalled by political opponents immediately after his completion of the canal a decade earlier! At mid century - when for the sake of economy the question of transferring the military canals to the provinces arose - military arguments prevailed over the interests of the British Treasury. A joint British commission concluded that, as a military work, responsibility lay with the mother country. The powerful military forces centred in London that had first created the canal still stretched across the Atlantic and held it to Britain. While, by 1850, self-defence in the Canadas certainly lagged behind self-government, support for the old imperial military ties on both sides of the ocean was nonetheless waning. With the collapse of revenues after 1847, maintenance costs for the canal were becoming an increasing burden on the British taxpayer. In a few short years, as the British military was centralized and brought directly under the control of parliament, the Treasury would have its way. The ancient authority of the British Ordnance Board - always the prime link in both building and maintaining the Rideau - was irrevocably undermined. The Rideau Canal was to be transferred to the province. (Perhaps an early example of downloading!) In 1856 - ironically the very year By’s town became the capital of Canada - his canal passed from the control of Great Britain. Remarkably, however, its fundamental military raison d’etre remained, to span the years of Confederation. The confidential Gordon Commission report of 1862 during the American Civil War declared - in words that might as well have been written in 1815, or 1826, or 1846 - that the old route of the Ottawa and Rideau was “absolutely essential” to Canadian defence. It was the only way to ensure a secure line of communication westward to the Great Lakes. An authoritative British military report two years later reiterated the time-proven mantra: if the Canadian government strengthened the fortifications in Kingston, the Rideau route could supply this vital fortress, which was the key strategic point for the naval and military security of inland Canada. Thus did the Rideau continue to provide the lynchpin of a defensible border throughout the middle half of the 19th century. The Duke of Wellington - and Lieutenant Colonel John By - could rest in peace! The need for that defended border rapidly declined in the early years of Confederation after the Treaty of Washington. But surely these men, the architect and the builder of the Rideau Canal - Britain’s most expensive overseas military work of the century - would have taken pride on November 11, 1871, to see that during the final withdrawal of British troops from North America, units of the Royal Engineers were among the last to leave Quebec City. This is a question usually related to water temperature. The chart to the right shows the temperature of Sand Lake for the past four summers. It warms up to over 20°C pretty consistently by early June. It’s interesting to note that the warmest peak temperature (29°C) was recorded in a year (2006) that had the lowest temperature average (20.5°C). I have no idea what that really means - but feel free to use it as a point of conversation at your next social gathering. The highest overall average over the measurement period (May 8 to October 30), was 2007 at 21.7°C . I presented similar charts to those on the left some time ago, but with our recent release of The Sweeney Diary I thought it was a good time to do it again. The chart on the top shows measured “ice-out” dates for Sand Lake for the past 25 years. The horizontal bars extend out to the actual “ice out” date. The average for this period is April 10. The lower chart is one I made up a few years when I first received a copy of the transcription of the Sweeney Diary. Peter Sweeney, the lockmaster at Jones Falls, was also responsible for Davis Lock during the winter. There are notations in his diary about how he got there. Looking at the late March entries we see him walking across the ice of Sand Lake to get to Davis Lock. But, usually by sometime in mid-April he’s rowing to Davis Lock. So, while Sweeney didn’t actually make note of the exact ice-out date, if he walked to the lock on April 4 and rowed to Davis on April 10, I’d make a guess that about April 7 would be the ice-out date. Doing that for the diary period resulted in the chart on the lower left, which has an average ice-out date of April 14. Please note that this is a completely non-scientific comparison since the margin of error with the Sweeney numbers is rather high. So reliable conclusions cannot be drawn.